I am a professional speaker. That is my job. But the truth is I used to be extremely uncomfortable with public speaking but I followed a formula and over time created an entire speaking business for myself. Like many I am an introvert and I get energy from being alone. Socializing exhausts me and I need time to recover from a day being around people. I am not anti-social, however often I prefer not to talk but rather to listen, to observe. But the good news is I went from being a very shy, insecure person who would turn bright red from having to speak to a group, to an author and speaker who gets paid to speak to hundreds of people. I have done 55 speeches in the last few years. If I can do this job and even thrive at it, you can too. I wrote a post on LinkedIn about my journey and readers wanted more so I wanted to give you ten tips on how to become a keynote speaker. The truth I I could write an entire book on this topic, but these ten tips are some of the major things I wish I had known when I first started. If you have more questions please ask them in the comments section. The good news is there is a formula to becoming a keynote speaker, and if you follow the formula, you can create a business for yourself. It might take you years, but if you work hard and trust the process, you can feasibly become a keynote speaker. 1. Find your focus. When I started I thought I would be a marketer. But I got hired in customer service at a Fortune 500 company even though I did not think that job was appealing at the time. But I took the job I realized this was an “ugly duckling” niche. No one thought customer service was as glamorous as marketing. That was 10 years ago. I pivoted to customer experience in 2014 simply because I was interested in it. And I focused all of my content on this topic. Find a niche. Don’t try and be everything to everyone. However if you want to be a keynote speaker you must need to build in that high level view to your speech topics. Most keynote speeches are a broad view that kick off or close an event. If you want to be a keynote speaker you can’t be overly granular. I often simply talk about why customer experience is important in my talks, and that sets the scene for the rest of the event. Here I am below in 2009 at an annual SOCAP contact center conference in New Orleans. 2. Practice speaking in public. I joined Toastmasters when I was 24 years old. I became the president – a volunteer-led position which gave me a role of running the meetings. It also forced me to attend every single meeting. I learned to not be afraid of standing at the front of a room with all eyes and ears on me. You will need to get feedback from people you trust. Toastmasters is a friendly environment full of people who are nervous to speak just like you – and they are invested in helping you achieve your goals. And remember on the outside we see a persona. Your job is to create a persona that you are happy with, and others can learn from and enjoy. There is no job quite like this one but you can learn from people in neighboring fields. You are like a lawyer framing an argument, or a politician, or a stand-up comedian, or a magician tasked with holding folks’ interest for forty five minutes or more. Have fun with it. You must look like you are not in pain on stage, but even enjoying yourself. Every speech I do I engage the audience and I have fun with them. They like to be involved and I like the engagement and feedback. 3. Speak for free. You can’t expect to be paid high fees out the gate. You will have to pay your dues until you can demand a fee. I did around 20 free speaking sessions until I started charging. While you are speaking for free, I encourage you to watch as many talks online or in person as you can. You will learn an immense amount from watching other people. You also should record and watch yourself. One time I spoke at an event for free and I got my hair and make-up done for the event. I also hired someone to record it because I didn’t have any footage yet. The sad part of it was there were only around 10 people in the room. Another speaker at the same time was more interesting than me and every attendee was in their room. But I looked at the positive and took the video footage and didn’t show the viewer my empty audience. The lesson? Do what you can where you can. A private moment after a speaking event in Chicago last month. It was for a manufacturing B2B company – supply chain B2B. As a speaker you are alone on the road a lot which calls for weird post-speaking bathroom selfies. 4. Stop speaking for free. At a certain point demand for your services will go up. Writing a book helps. Writing a lot of content that people read helps. Podcasts…youtube videos….you have to be everywhere, and do a good job on the channels you frequent. Then you will build enough of a following you can demand a fee. Sometimes I wonder, when people ask me to speak for free (which happens ALL THE TIME – and it happens to EVERY speaker so don’t let it bruise your ego)…if the person asking me to speak would want to do their own job if they weren’t being paid. This is one of the more annoying parts of the job – because some people have a full time job and speak on the side to build their name. But others like me do this as a full time job. So of course you don’t want to get people inquiring who expect you to work for free as well. NOTE – remember to always decline politely. Once I was working as a volunteer for a business non-profit. We didn’t have much budget but I was in the position of trying to organize an event on a yacht. I asked a prominent customer service speaker and columnist if he would speak and told him our small budget. He was furious “How dare you! !” Unfortunately now I run into him and his content and I know that behind his avatar he is not a nice guy. I will never lift a finger to help him. People don’t forget how you treat them, so remember that what goes around comes around. If you are polite and courteous to people even when you aren’t in the mood, you will save your reputation. 5. Marketing. The hardest part of having a speaking business is getting the speaking gigs. You will need to always ask the conference organizer for video footage of yourself speaking so you can create a speaking reel. When you get speaking requests save the information of every requester. Create and continually update your media kit, a downloadable pdf with all your media materials. Call yourself a keynote speaker if you want keynote speaking bookings. As a speaker you are a marketer and a salesperson. Don’t be spammy. There are always shortcuts in life especially with the nature of the web. I can’t count the amount of email lists I unsubscribe from every single day that people add me to without my permission. This is not the way to close deals. These aren’t the leads you want anyway. Building a business takes time. It took about three years for me to be consistently busy and getting multiple requests every week. Three years of hard work, and I’ve been focusing on this topic for ten. There are no shortcuts in life. In the end you’ll be happy you took the long road. If you write every week eventually people will start picking up your stuff and promoting you. Keep your head down and focus on good content. 6. Your image matters. You are the product. You need to take care of your outer shell. It would be nice if everyone could just see us for our beautiful soul, but we live in a society where appearance matters. If you want to be on a stage in front of 100s of people, or even 10 people, you have to take care of your looks. You should be dressed in tailored clothes that fit you and look flattering on you. Everyone is different, and some speakers have a look that suits them that is not traditional. My husband who is a speaker wears a fitted t-shirt and jeans. He looks amazing in it and feels more comfortable in that than a suit. In the last few years I have invested in a wardrobe that I feel confident in. I have a friend who was a model and knows fashion. I took her shopping at Nordstrom Rack (affordable) with me and she picked out a ton of looks for me. It helps to hire an expert or bring someone who knows clothes. On shoes – you should be able to walk in your shoes comfortably – so you are not wobbling on the stage. For me personally I have found I can’t walk well in heels on a stage so I wear wedges or fat heeled pumps. Your hair should look clean. And for women, don’t hide in your hair. Hair should not cover your face. Nails should be clean/manicured. Men too. The good news is you are not a celebrity – you don’t need to look like Britney Spears or The Rock. You just need to look professional. Be a human being and don’t try to be perfect. It’s not possible. I brought a friend shopping with me who introduced me to Karen Millen dresses. They call their clothes “armor” because women feel ready for anything in their well-tailored dresses. This is from a marketing photo shoot in Chinatown SF. Fierce: Is it aspirational or does it have a glamorous kind of spin to it? Funny: Does it make you laugh, is it self- deprecating, is it comedic? She says the project must have two of these elements. There are rare occasions when I speak for free or do things for free. You need to evaluate if they are worth the return, for example will you get video footage, a testimonial, or experience you need? Perhaps you need photos or videos of yourself speaking to a larger group? People often write me for advice, and I give advice but only over email – not over the phone, because as you know from the first paragraph, I am introverted and being on the phone drains me. Thoughts on leads and inquiries; “Million Dollar Consulting” speaker and author Alan Weiss in his online videos once said he won’t even have conversations with what he calls “gate-keepers.” These are lower level employees who are only coordinating. They do not have a budget, they are only soliciting information. For me I would never swear off of conversations with an entire group. You really never know. Here’s the deal, I can guarantee you that at some point your time will be wasted. I understand sometimes as a speaker you waste time on the phone or in long email exchanges with people who never intend to book you or pay you. But it still matters that you engage with and treat these folks well. I have booked many speaking gigs through assistants who are managing requests and budgets for their bosses. 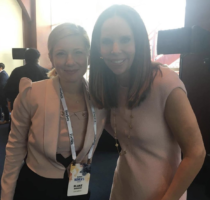 Here is a photo of me and Moira Forbes at the Forbes Women’s Summit in NYC. I write a free column on Forbes.com. I won’t pretend we are friends, I asked for this photo and she has no idea who I am. But I write for Forbes, a magazine her family started and you should always ask for the photo and post it. Even if you feel dumb or awkward which I did. 8. Boundaries. In business and in life boundaries are important. You need boundaries when clients ask you to do things without compensating you extra. 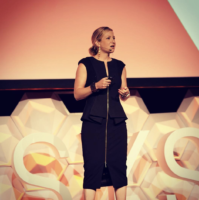 You need boundaries when clients start asking you to say things on stage you don’t want to say, or tailoring and heavily editing a presentation that you’ve already created. You might need boundaries when other people start asking you for your attention – or to promote their blog, product etc. I get these every single day. Many of them I do not respond to. I would be working for free 24-7 if I did. I would have no energy for my business, my family or me. You will have to get to know you – and what you’re comfortable with. You can find a polite way to say “no” and stand your ground. I often tell people you can do this job (of being a speaker) if you know how to say “no.” You will be saying no a lot. Sometimes I get offered to speak, but the fee is far below what I ask. Why would I say no? I say no – because I have a child at home and for me this job is quite taxing. It’s taxing because you travel and – yes – speaking can feel exhausting. You expend a lot of energy. The money has to be worth it. I charge a steep fee because the client is not only paying me for the one hour speech, they are paying me for my ten years of experience in the space, the work I do for free (content), and the time I spend traveling and energy I expend speaking. I often promote their business. It’s a ton of work. You have to build a life and a business that is sustainable for you – on your terms. 9. Gearing Up And Coming Down Off A Speech. Speaking requires a lot of effort. You often book an event 3 to 6 months before, sometimes longer. It can take months of preparation. You might need to pay a designer to design a Prezi or powerpoint deck for you. You will need to rehearse your speech (I record mine) and make sure you know your material. And there’s those annoying things called nerves. Anticipating travel and speaking can sometimes be worse than the actual speech. Most performers still get nervous, even if they have been doing this for years. Framing is important. You can tell yourself you are excited rather than nervous, but you need to recognize your feelings and deal with them somehow. You will need to get used to traveling and having a routine or ritual when you do travel – which will aid in the travel. You need to make sure you are organized and have all your travel logistics together. Your clothes should be packed in advance and I always take an extra dress with me just in case. I only take a carry-on because speeches are often only one night travel days for me. The only thing that makes this job much easier is being organized and anticipating your needs. I am very organized – as much as I can be – because sometimes on the road things happen and when they do you have to stay calm. Staying calm is one of the most important parts of the job. One time I had two speaking gigs back to back and at the airport between the two gigs I misplaced my purse and my wallet. It felt awful. I was stressed out and I cried to my husband. I was not calm. Stuff happens, stay calm. Now I know to block out my calendar the day before I travel and the day after (or more). After speaking I feel zapped of energy and I need time to recover. I sleep, I exercise, I meditate, I walk and pet my dogs, I cook healthy food, I hang out with my husband and daughter, I get a massage, I stare at the ceiling and waste time…. If I book too many meetings or work activities the work suffers and I don’t recover as quickly. 10. Dealing With Uncertainty.This business is uncertain. You might not know how many events you will do during the year. Sometimes I get booked for an event six weeks or less in advance. You will need to learn to ride the waves of uncertainty. Summers are quiet, and holidays are quiet. How will you productively use your time? How will you grow your email list? How will you improve your content? How will you become a better speaker? Think of yourself as a fisherman. You need to cast as wide a net as possible to catch as many big fish as possible. Most of the work I do is for free, but I do it to build my brand and generate those future speaking gigs I believe I can generate for myself. To help deal with uncertainty, don’t spend too much money on marketing and operations. You need enough savings so you can afford to have a few quiet months. This savings will allow you to focus and take more risks. As you make more money you can spend more money. Image from my instagram(BlakeMMorgan) where I shamelessly promote myself. Because if you’re not going to promote you no one else will. Speaking is not a perfect business but I enjoy it because I am my own boss, and you I get paid well for the work that I do. I don’t like having a boss and I don’t like corporate politics. This job is not easy, and most people would literally rather die than be on a stage. But public speaking is like a muscle. The more you practice, the stronger you get. You have to build up to where you can speak to bigger and bigger audiences and demand higher and higher fees. But if you don’t use it you lose it, so the most important thing is to keep going. In the comments section please share with me one tip that has worked for you, or perhaps a challenge you face as you build your speaking career. If you’d like to follow me please feel free to sign up for my newsletter here or visit my website here. 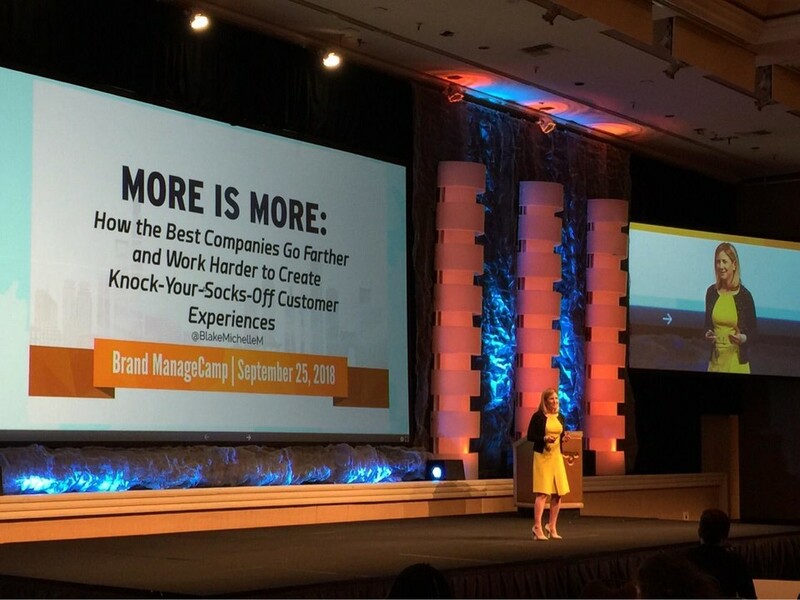 I am a leader in customer experience, a keynote speaker and customer experience futurist currently working on my second book with HarperCollins on customer experience technology. 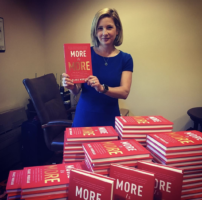 My first book is “More is More: How The Best Companies Work Harder And Go Farther To Create Knock Your Socks Off Customer Experiences.” I’m adjunct faculty at the Rutgers executive education MBA program. I am the host of The Modern Customer Podcast and a weekly customer experience video series on YouTube. I live in the Bay Area with my husband, daughter and our two dogs. 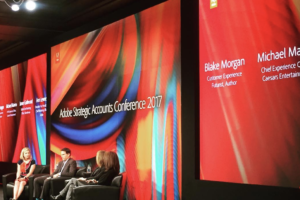 Contact: blake@blakemichellemorgan.com or 347 907 0968.